This button will show or hide LightBox. The default hotkey is the comma key (,) but you can change it if you want by Ctrl+Alt+clicking this button and then pressing the key you want to use. Remember to store the hotkey by pressing Preferences>Hotkeys>Store. It will then be available each time you start ZBrushCore. 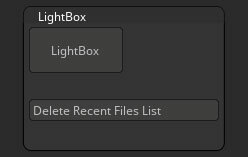 Press this button to delete the files displayed on the LightBox Recent tab.